Due to recent accidents involving Pivot irrigation machines, we’ve decided to make a post explaining some directions that are usually listed in every Pivot operator’s manual. Many irrigators have received minor tingles while working around electrical irrigation machinery. Under pressure to keep the system running, they tend to ignore warning signs until serious injury occurs. Anyone who is going to operate, maintain or work around a Pivot irrigation system should be familiar with operating and maintenance procedures and safety information. Electric power should be always disconnected before servicing the machine. There should be a device on the main switch which can be operated only by the person performing the maintenance or service. Irrigation pumps and systems should be shut off before turning off the main power disconnect. Everyone should be in the clear before the machine is turned back on. Hands or clothing should not come in contact with moving parts such as wheel spikes, oil, or water cylinders and linkages, chains and sprockets, drivelines, and pulleys. During an electrical storm, everybody should be away from the machine. The center Pivot makes a good path to earth. Also, it is probably the highest object in the field, which makes it a good lightning receptor. It must be used a non-conductive ladder to perform overhead maintenance. Portable lifts can be used, however, there should be some provision for guard rails for the person who is working on the platform. Center Pivots are not playground equipment. Nobody should be allowed, especially children, to play or climb around the machine. Those unfamiliar with center Pivot operation may fail to understand the hazards presented by the intermittant automatic operation and slow speed of the equipment. All three fase electrical equipment must be connected to a grounded four wire electrical service. The electrical service should be installed according to the manufacturer’s specifications, the National Electric Code and local codes. The electrical inspection authority should inspect the system to determine if there are any unsafe or unauthorized electrical connections prior to any attempted operation of the machine. 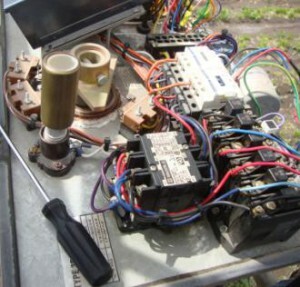 Repair or service of a high voltage electrical system requires professional, qualified training. Care should be taken when fueling equipment. Disel does not pose the problems that gas products pose but it can catch fire. Gasoline, methane and propane all ignite with from 2 to 15 percent vapor concentration. Gasoline never should be used as a cleaning agent, since it could ignite from a static or open spark. Electric power units should be properly grounded and de-energized when being worked on. Capacitors on electric motors can hold a charge even though the electricity is turned off. If there’s a short circuit, nobody should touch the machine. A competent electrician will have to check out the system. Equipment should not be parked near a wheel track, beacuse center Pivots have good traction and it’s possible for the to climb over equipment or even buildings. When towing from field to field, ditches, overhead power lines, buildings… should be avoided. All power lines around a Pivot should be buried and guarded. The area should be marked with a buried power line sign. Water should not spray on state and county roadways; this is a serious hazard and should not be allowed. Everybody should avoid getting in contact with high pressure water streams such as the end guns. Exposure to system spray should be avoided when chemicals are being injected into the water. The spray should not blow or drift past the area of intended operation. Engines and generators should run only at the recommended limits as set by the manufacturer. Excessive high or low speed ould cause undue wear and a short life for the equipment. Periodically the system should be checked for any loose or missing bolts or other signs of possible structural collapse. One response to "Safety precautions"
Great reminder of my days working on, erecting new pivots and fixing damaged center pivots. Remember opening control panel with plastic handled pliers and what a electrical spark due to mice eating wires causing electrical wires to touch each other.